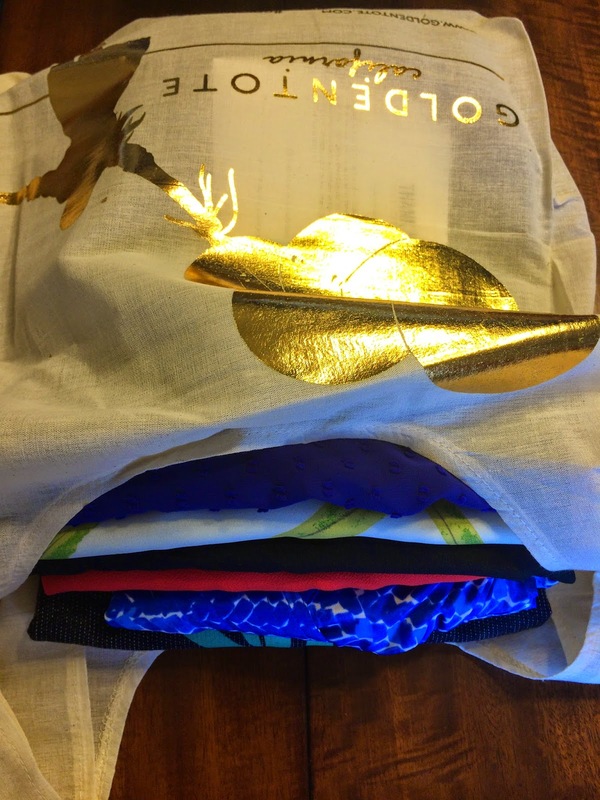 Golden Tote is one of my most anticipated sales each month and for March there was some issues with the sale. Golden Tote launched a new website in March and do website launches ever go smoothly (I think not). They ended up pushing the date of tote launch back a week or two to get the website functioning properly. I ordered my tote the first day they were available and I just received it yesterday. And now there is no way to know what you are getting (besides the items you choose), so my surprises really were a surprise! I was excited and nervous to open my tote. There were some surprises I loved and some I didn't, but that's pretty normal. Golden Tote changed the style profile and now it has more questions and is more specific to what you'd like to receive, so I was hoping for a tote that was a perfect fit for me! 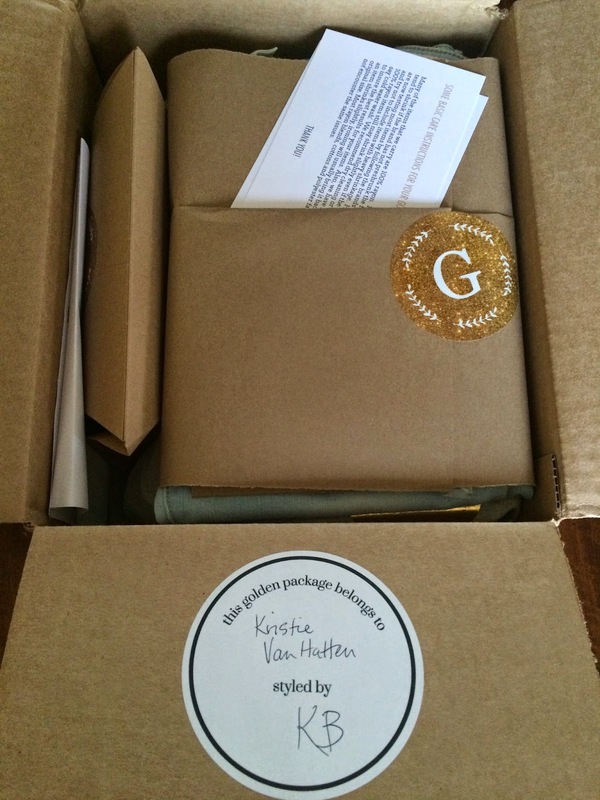 Golden Tote started using stickers on their boxes last month, so you know who your stylist is. I had the same stylist as last month KB. And I was fine with that because she did a great job picking out my surprise items last month! Golden Tote also included an invoice this month with details about the chosen items and the surprise items. I love this! It should prevent being sent duplicate surprise items, if you order multiple totes within the same month using the same profile. They did mention that if you order totes under different profiles, you could be sent duplicate items, because the system views different profiles as different people. Now, I'm sure you're much more interested to see what I got in my tote, so I'll give some sneak peeks. They also had a really cute tote bag design this month with a girl holding a bunch of balloons! 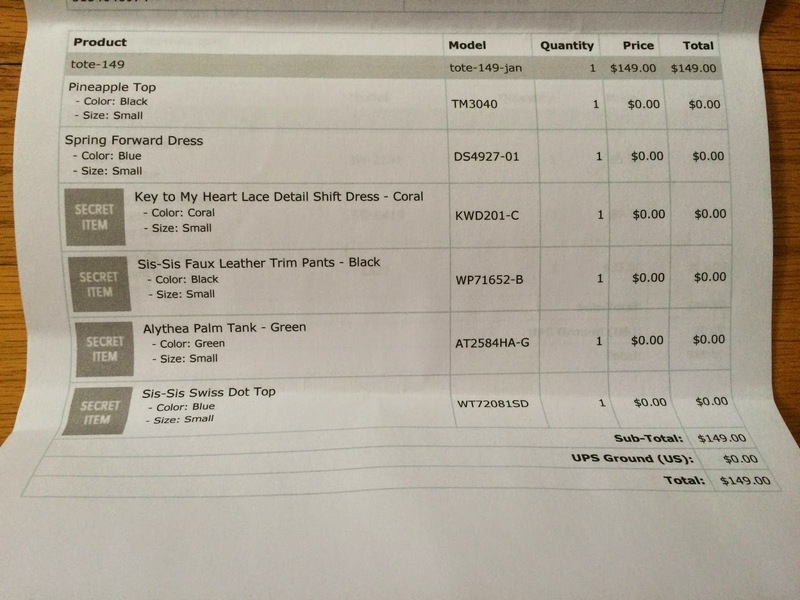 I did order a few items from the boutique so this picture shows them on top. Unfortunately, I didn't take any pictures wearing the sunglasses because they are too large for my tiny face. 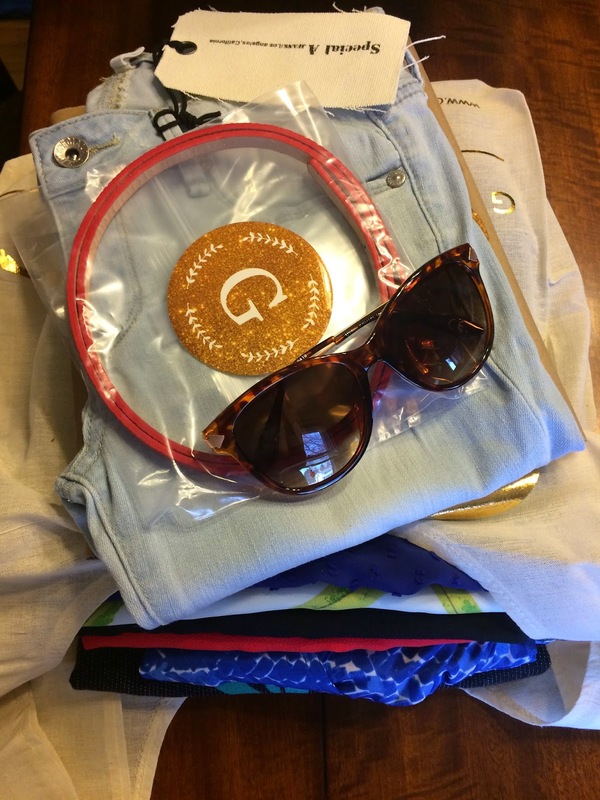 And if you're a Golden Tote addict like me and have been stalking the Facebook Golden Tote Trading Group reveals of March totes, you might be able to identify a few of the items I received in my tote! This shows everything that is included in the $149 tote without my boutique purchase, so you have a better idea of what you might get if you order. A large tote generally has 6 items, from my experience. And sometimes if you order an expensive item, they'll let you know in the item description that you'll receive a 5 item tote (2 chosen items plus 3 surprises). I don't believe any of the chosen items for March resulted in a 5 item tote. Now onto what I received. The first chosen item and reason for ordering this month was the THML Pineapple Shirt. I'm not sure what the appeal was, but I knew I couldn't live without this shirt! And I also ordered the Special A light wash distressed skinny jeans (that I wear in almost every photo) as a boutique purchase ahead of the sale, because I wanted to make sure I could return them if they didn't fit. The jeans sold out really quick and are no longer available on the Golden Tote site. I love both of these items! They are both completely comfy and totally great for weekend wear!!! My second chosen item was the Collective Concepts Spring Forward Dress in blue. I definitely don't need any more dresses (or clothes for that matter), but I couldn't resist this beauty. It fits nice, and has a tie waist. I like the length for work too. Please excuse my very pale legs (it's been a very long winter). I will be wearing this tomorrow for Easter (with tights and a cardigan)! And now for the fun part, the surprises!!! I'm going to save the best for last, because two surprises worked and two didn't. The first surprise that didn't work was Sis Sis Faux Leather Trim Pants in black. These fit me too large and have a whole lot of static going on. I've also seen these in an olive color and I think if I received the olive I may have tried to make them work. But I just don't need another pair of black pants, especially if they don't fit properly. I had a difficult time styling these too. They have a cute ankle detail that I like, but I'm going to be trying to trade these on the Golden Tote Trading Group. You can also see the skinny red belt I purchased from the boutique in this picture. 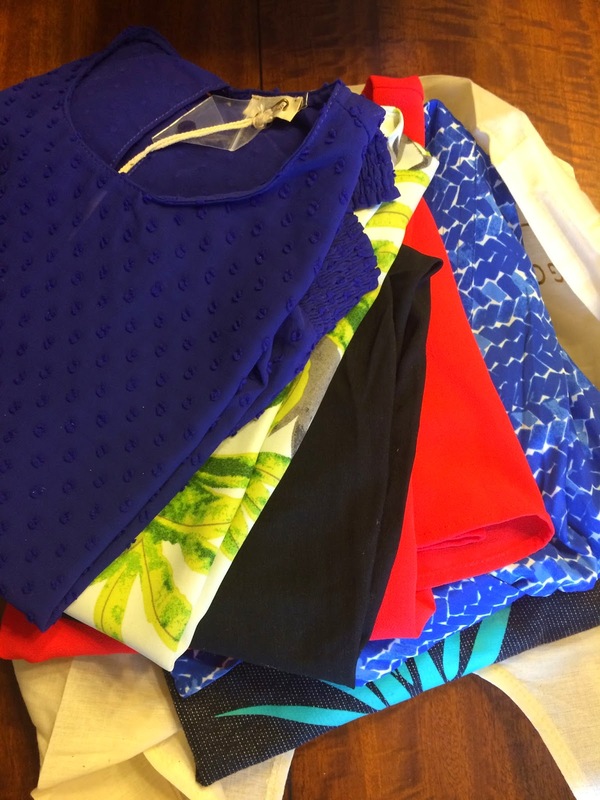 The other item that I wasn't crazy about was the Sis Sis Swiss Dot Top in blue. This fits fine and looks decent, but I have too many tops like this. And I'm never crazy about a banded waist or wrists, so I'll be trying to trade this also. It is a beautiful cobalt blue color which I love! And now for the good surprises! They released this as a spoiler item and I requested it in my notes in my profile, so I was happy to see it included in my tote. It's the Everly Lace Detail Shift Dress in coral. I love the bright, vibrant color of this dress, and I don't own anything like it. I was a bit disappointed because when I tried it on it fits very large. I tried belting it for the pictures. I'm not sure I'm completely in love with this dress on me, but I will be trying my hardest to make it work, because it is such a pretty dress! And I was in love with it from first sight!!! And my final surprise (I saved my favorite for last)...is something I never would have picked up in a store or ever tried on. It's the Alythea Palm Tank in green. This is a crazy loud print, but I totally love it. It fits perfectly and has a beautiful scalloped hem, which I love! I am so happy Golden Tote sends me items I would never choose for myself. They always end up being my favorite pieces and items I get tons of compliments on. I was happy with what was chosen for me, even if a couple items didn't work for me. I think it was perfectly catered to my profile, which stated I mainly dress for work, casual weekend, and work to a night out. I also selected Casual, Classic, Feminine, and Trendy. I think these pieces fit my selections nicely. I'm happy with my March Golden Tote. The April totes will go on sale Monday, April 13th!